WattHead welcomes new contributor, Kriss Bergethon. An engineer by training now working to educate and empower people with clean energy, Kriss works with SolarSphere.com and will be reporting periodically on solar energy news for WattHead. Rapid changes in the solar power sector are fueling a green energy revolution. With so much emphasis on solving the global warming puzzle, technology in solar is advancing very quickly and may be the answer we've been looking for. Let's take a look at how this industry is changing so quickly. Companies such as FirstSolar, Nanosolar, and Sharp are quickly bringing solar film, also called thin-film solar, to market. We've been promised this amazing technology for years and it seems its finally here. Thin film is manufactured in a way that is similar to printing, and the product often comes in a roll. This is a much more efficient way of producing cells than the traditional solar panel, which was made in a process similar to microchips. We are seeing initial pricing on this new technology in the $1 to $2/watt range. 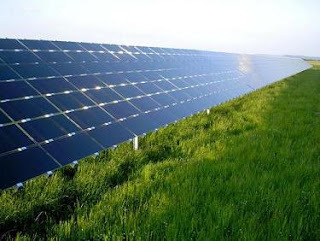 Solar efficiency is the measure of power produced versus the sun's energy that hits the panel. In the past any efficiency over 15% was seen as good, and approaching 20% was great. Now such panels as SunPower's are regularly achieving 22%. That means more bang for buck and more energy produced for every square inch of panel installed. Solar film is levelling the field on efficiency. Thin film traditionally had efficiencies in the 10% area, roughly half the efficiency of crystalline panels. While that measured quantity has trended up slightly, industry professionals are finding that actual production is higher. This is because the film produces better in diffuse light and partially shaded conditions than panels. In one project in Israel, installers recently found that the thin film solar only required 25% more surface area compared to crystalline panels to produce the same energy. This means that actual efficiency is probably closer to 15% for film.